As of this writing, there are 49 customer comments and 7 answered questions for the Joiedomi 5ft Self-Inflatable Gingerbread Man. I have read the customer feedback and then condensed the results into this review. I hope that this review helps you when shopping for the best Christmas decorations to add to your yard. The Joiedomi 5ft Self-Inflatable Gingerbread Man is the perfect addition to your yard. It includes a 5-foot inflatable gingerbread man with a fixed sandbag, 2 fasten ropes, 4 ground stakes, and a plug with UL certification. This inflatable gingerbread man has LED swirling lights built inside. It is very easy to set up. This inflatable gingerbread man can be used both indoors and outdoors. It is non-toxic, and it meets the US Standard. The majority of customers who set this up said, that it was very easy to assemble. Here is one of the comments about set up left by a customer, "Set up was super quick. It only took about a minute or two to inflate. This package comes with everything that you need to stabilize him. Would definitely recommend." One of the nice things about The Joiedomi 5ft Self-Inflatable Gingerbread Man is that it can be added to other parts of your display. If you have snowmen and candy canes, and things of that nature, this inflatable gingerbread man should fit right in. A customer shared, "I added this to our lawn's decorations, and I placed the lighted "Merry Christmas" sign right in front of it. (See the Merry Christmas sign here on Amazon.) It looks great and is warm and inviting." Depending on the amount and intensity of the wind in your area, you may need more cord and stakes to keep this Gingerbread Man display from blowing over. A customer shared, "Very cute. Depending on weather conditions, some extra paracord might need to be added to his sides to stake him in front and to the back. In addition to the cord and stakes that come from his sides and sides of feet. To keep him from blowing forward or backward." In addition to keeping the lights on, you will need to keep this display plugged in, in order to keep it inflated. The fan constantly blows air to keep the gingerbread man standing. A customer share, "Just as described. You just keep it plugged in to blow and light up, good quality for the price. 5ft at the very top of hat and stands." Some customers complained that the fan did not keep working for very long. The fan, of course, is needed in order for the gingerbread man to be standing, and to be seen. A customer shared, "Fan died in 3 weeks. I don’t expect it to last forever but 3 weeks of use is unacceptable. Note: other inflatables next to it have been fine." 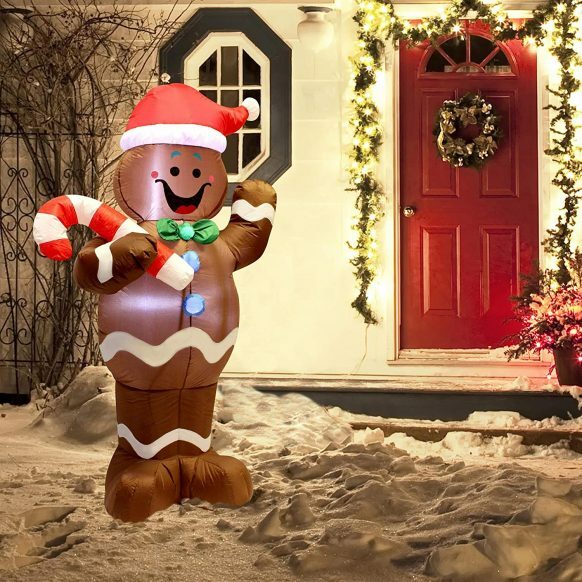 The Joiedomi 5ft Self-Inflatable Gingerbread Man makes for a nice welcoming display at the entranceway or front porch of your house. Guests should feel jolly just by looking at it. A customer said, "Placed it by my front porch to greet my guest. He really seemed to wave at them. Was so cute. Very happy with this purchase." The majority of customers thought that the price was good for The Joiedomi 5ft Self-Inflatable Gingerbread Man. One person said,"Cutest gingerbread man! Lights up nice and bright! Decent price for 5ft inflatable." Perhaps the most important part of this Christmas display is the fan. If the fan doesn't work, the gingerbread man will not stand up. According to customers, some gingerbread men would not inflate. This can be a disappointment, especially so, if you have children or guests that come to watch the display go up. A disappointed customer shared, "Let me begin by telling you that on December 1st, 2017 my wife and friends had an amazing day in New York City. It was a day I will never forget, kicking off the holiday season by observing the world-renowned Rockefeller Center Christmas tree. A day that was tarnished by this terrible and faulty "5 foot tall !" Gingerbread Man inflatable lawn decoration. Upon returning home I was excited the discover a small package on my porch, anticipating the Gingerbread Man that would compete the array of holiday decor on my deck. Family and Friends gathered in anticipation as I assembled the Gingerbread Man. I eagerly flipped the switched, the decks lights illuminated, everything was perfect except.... the Gingerbread Man remained lying supine, limp, gasping for life. The Gingerbread Man's lifeline, the fan, was pulsating, never running more than 1 or 2 seconds. The cheerful inflatable Gingerbread Man never stood a chance. I am leaving this review because I would want anyone to experience not only the embarrassment but the let down of my family and friends who traveled a great distance to observe my holiday spectacle. I had to return the item and hope that I can find another inflated to fill the void in time for Christmas." Those people who live at altitudes around a mile high or higher, probably know that cooking and other activities involving oxygen and air pressure change the higher you go up. Well, have no fear, this gingerbread man should work fine at higher altitudes. It also should work well in the cold temperatures according to customers. One person said, "Super Gingerbread Man has survived bitter cold temperatures for 2 nights followed by 45-50 mph wind gusts in Colorado! During the high winds, Gingerbread Man was vigorously waving to everyone as he stood tall (thankfully he was thoroughly staked down). I highly recommend Mr. Gingerbread Man. He’s a fun Holiday decoration at a reasonable price. He also is proving he can happily stand tall to mixed weather conditions (when properly secured) at an altitude of 6,600 feet above sea level." If this Inflatable Gingerbread Man gets a hole in it, it won't work right. The fan pumps the air in it, so it's important that the gingerbread man does not have any holes. Some people questioned if the inflatable had holes or if the fan didn't work. The fan will need to work properly and the inflatable gingerbread man will need to not have any holes in order for it to stand up properly. Some had issues with it standing up. A customer said, "It is cute and will be displayed in my yard this Christmas, but it may have a hole in it because it doesn't look like it is inflating right. Either that or the motor isn't strong enough. I just took it out of the package today and set it up. A little upsetting." The Joiedomi 5ft Self-Inflatable Gingerbread Man includes a 5-foot inflatable gingerbread man with a fixed sandbag, 2 fasten ropes, 4 ground stakes, and a plug with UL certification. This Christmas display has LED swirling lights built inside. The set up is easy. This inflatable gingerbread man can be used both indoors and outdoors. It is non-toxic, and it meets the US Standards. Some of the complaints about this Christmas display include the following: Some fans arrived not working, or prematurely stopping, Some displays may have arrived with punctures in the gingerbread man, and you may need more cord and stakes than are provided. Other than that, most of the customers who purchased The Joiedomi 5ft Self-Inflatable Gingerbread Man were happy with their purchase. Most people thought it was a nice and cheerful display to add to a front entrance way or porch. It also can easily be added to most other Christmas displays. Here are some top questions that I found for people considering buying the Joiedomi 5ft Self-Inflatable Gingerbread Man. Does this inflatable gingerbread man need to stay plugged in all the time? Yes, the fan has to be constantly going in order for this inflatable gingerbread man to stay inflated. You'll also need it to be plugged in so that the lights will work. Does this come with the pump to keep the gingerbread man blown up? Yes, the pump is included and is located at the bottom of the gingerbread man. Does this product have a two or three prong charging outlet? It has a two prong charging outlet.